A good podcast is often thought-provoking as well as entertaining, something that you can put on at your convenience. You just have to choose an episode — a conversation between people — and your phone or computer will allow you to take part in it free of charge. I discovered podcasts back in 2013. I had become a father of twins about a year before that, and I was looking for something to keep my mind sharp in between irregular sleeping cycles. Before I knew it, I replaced listening to music with podcasts, and that’s a big deal, as I've grown up with music and I enjoy writing and playing it. My first shows were The Joe Rogan Podcast and WTF with Marc Maron, and I would recommend them to anybody who interested in various people sharing stories about different things of the world. 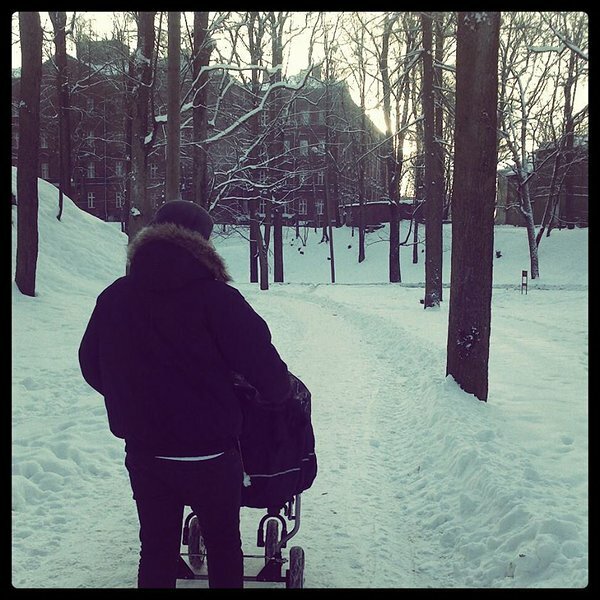 Mathias-Erik walking at Toomemägi with his kids, listening to podcasts. As I was getting into this new, fascinating aspect of my life, I found myself thinking about all of the amazing conversations I've had over the years with my friends. The idea of recording them, even if it's just for myself, sparked enough courage to pretty much immediately set up the first show. I called my bandmate from England to visit our offices and we chatted about his childhood and how he ended up working in Estonia. It took that first recording to realize that this is more than a hobby — it's a chance to get to know the people around me in a more profound way. I started working as the support agent for Voog at the beginning of 2014, and by doing so I had a great opportunity to interact with various people in different situations every day. It just so happened that I messaged an MMA legend in Estonia, Jorgen Matsi. He needed help setting up a website for his father-in-law, and we remained contacts on Facebook. About three years later, I stumbled upon a post on his wall, asking if anyone has ever considered creating a podcast in our hometown. We started out by simply creating a document to brief everything regarding our show — the title, format, segments, topics, our target audience, and even marketing options. Over the course of six months we just collected data, and with the beginning of 2017, we finally decided to go for it. After the first episode, we promised to record a show per week, making it one of the busiest podcasts in Estonia to date. We were caught off guard by the feedback from the first show. About 500 people started following us on Facebook, we made it to the top of the Estonian iTunes charts, and people started sending us messages. It was pretty clear that we'd tapped into an audience who enjoyed two young fathers talking about family life, working out, literature, movies, and even psychology. Shortly after starting out, we began inviting various people to the show. Among others, we've had sleep technologist Kene Vernik, stand-up comedian Ari Matti Mustonen, cybersecurity specialist Dan Bogdanov, neurosurgeon Ando Vaher, musician Kallervo Karu and virtual reality enthusiast Madis Vasser visit us. And our conversations aren't always about their daily jobs, but rather organic, about life and times. Also, I've had a chance to visit various shows myself — for example, the social media podcast 7Blaze, with another podcast host, Indrek Põldvee (from Sorry As A Service, Hakkame Tegutsema). By the way, did you know that there are many great podcasts in Estonian? For example, Naistejutud and Puhata ja Mängida. If you know any great ones yourself, please leave them in the comments. In September we joined Raadio 2 — the biggest radio station in Estonia — where we're talking every two weeks on a show called Agenda. This is definitely a cool opportunity for us, and we've gained loads of new listeners its help. People have reached out to say that our show helped them through a nightshift or relieved homesickness. To us, this is huge! Jorgen and I hosted the first year together, but since scheduling our busy lives is often a challenge, we struck upon the idea of inviting a third host aboard. So, in January 2018 we welcomed Mats Volberg, a philosopher (PhD, University of York) who works at Tartu University as a researcher. 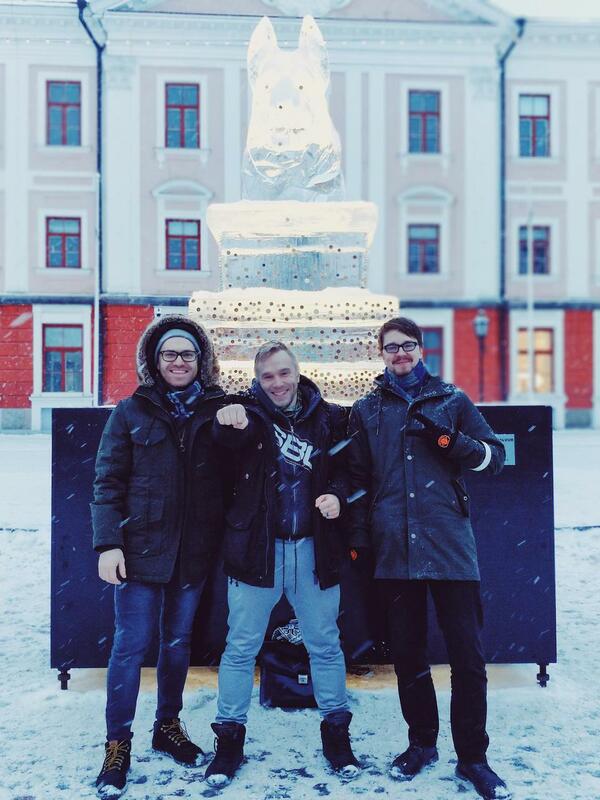 Mõtteaine in 2018: Mathias-Erik Tempel, Jorgen Matsi, and Mats Volberg in the Tartu Town Square. We have ambitious plans for the upcoming season — to order some new gear and increase the sound quality of the show, start a YouTube channel and launch our first merchandise items — and we hope that you're up for the ride. Show your support by subscribing to us on your favorite podcast platform. If you've been thinking about beginning a new project but haven't done so, find some time and give it a go. Start by mapping out your ideas, just like I did for Mõtteaine. We're all busy — I'm hosting a podcast after a long day at the office, plus I'm working as a lecturer, raising two kids, and singing and managing a band. I've always known that the effort would be worth it in the long run. Come and join us by checking out our website, Facebook, and Instagram feeds. And if you have any feedback or want to share your ideas with me, send me an e-mail.